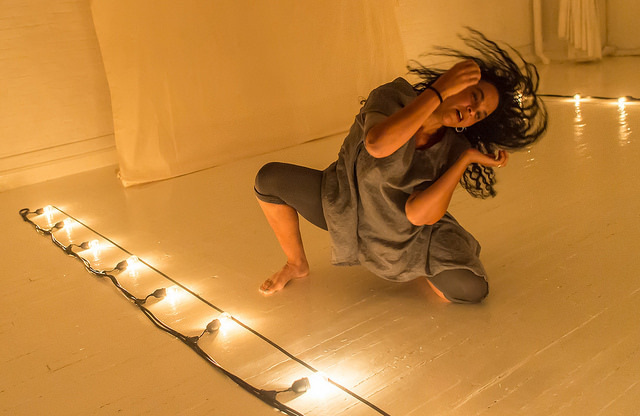 Having spent the early afternoon at 92Y Harkness visiting Pino-Latino's intersection of Asian and Latinx cultures, I headed to Midtown West for Gabri Christa's multimedia solo, Magdalena. I found the Curaçao-born dance artist/filmmaker greeting people arriving at Orietta Crispino's tiny studio at Theaterlab, carefully guarding a square of white performance space surrounded on three sides by a string of light bulbs from heedless, bull-in-china-shop audience members. Towards the rear of the demarcated space, a baby doll of fragile, chocolate-brown porcelain sat atop an ancient valise. At the start of her hour-long performance, Christa, a woman of mixed races and cultures, began her storytelling by pointing to the Black doll and relaying its history. (How did this toy, so rare in the Europe of her Dutch mother Magdalena's youth, come into her family? From an auntie who'd gotten it as a present from her Black, and married, lover.) As in the best stories, that single point and gaze would steadily open up many vibrant channels of memory, history, questions, feelings. We would be introduced to a family, to a war, to Catholic schooling, to interracial love, to the Black Caribbean, to adventurous vitality and, finally, to aging and dementia. For this is a story moving towards her mother's state of forgetting, and it is an act of loving discovery, recall and reclamation. A gifted storyteller, Christa employs many supportive tools--among them, a treasure trove of archival visual imagery, some of it from personal family materials. But none of that would matter if the interconnected tales themselves--as in Bennyroyce Royon's new piece for Ballet Hispánico--did not rest on a foundation of humanity. Magdalena continues through Saturday, September 22, but hurry. Seating is extremely limited. For information and tickets, click here.